Dogs sometimes need to hide from their owners, especially when they've chewed on something their master values. Unlike ninja cats, however, they often fail at playing hide-and-seek, which provides their owners with cute and hilarious photo-ops. 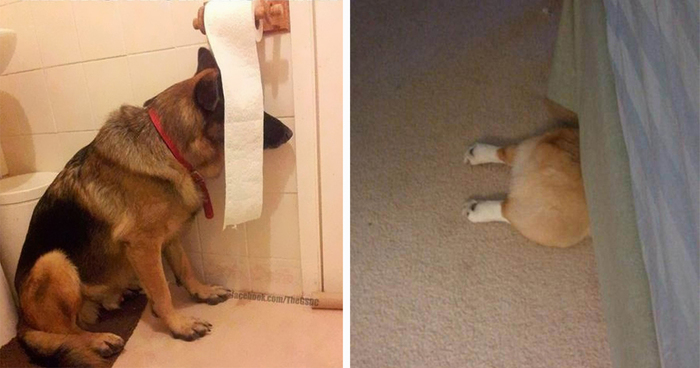 This list has some of the best examples of dogs trying to hide from their owners. If you have a picture of a dog that thinks it's a hide-and-seek genius, we'd love to see it! Make sure to vote for your favorite hidden pups as well. You can't see me ? For a short moment I must look at you , my poor eyes ! Dear Lord....I need train fare and pockets. As kids my sister & I used to do this and pretend to be a bride. Ha Ha Ha. LOL! That's so my Shiba! After the brushing I feel better hear ! Without the collar, I'd say that was one smart doggie. "Hurry up sir! The door's about to clo-..."
Uuuhhh....I just followed the cat in here. I am so ashamed of this head gear, HIDE ME! This dog just looks like he did something he shouldn't have done, and he knows it. Lord....if he jumps in bed one more time. Ah! The sand can woof! Woof!! Feel like an astronaut in a space ship. Yay!! Hide and seek. Hide and seek. Thanks Apple. She does this when she doesn't want to go to her kennel!